...then you really owe it to yourself to go find the back issues, or if you're patient enough then to wait for the trade paperback and buy that as soon as it comes out. 'Cuz this seriously might be the greatest story about Wolverine that Marvel Comics has ever published. I first wrote about the "Old Man Logan" arc back in August when Wolverine #66 hit the stands. The story begins fifty years in the future, long after Logan wandered away and threw himself into self pity following the night that the bad guys finally conquered the country (and maybe the world). In all that time, Logan hasn't "popped his claws" even once, having relegated himself to the role of a pacifistic farmer, husband and father. During the long odyssey that he and the now-blind Hawkeye have taken across the ruined plains of America, there have been heavy hints that whatever it was that drove Wolverine to renounce violence, it must have been very, very bad. 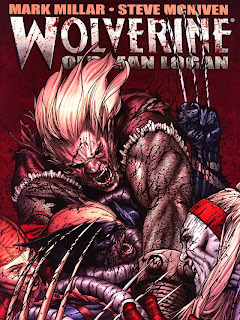 With Wolverine #70 and Part 5 of "Old Man Logan", now we know what it was. Wolverine has long been the most popular mutant in the Marvel stable. But I don't know, in the almost 35 years since the character was introduced, if there has been a single story... nay, a single issue... that has evoked so much both horror and empathy for the guy. Whatever it was that you thought might have been cause for Wolverine to "throw down his sword" and walk away from the fight, that probably is still not anywhere close to what writer Mark Millar came up with. I'm not saying that it will go down in comics history as being anywhere as tragic as the death of Gwen Stacy, but ya gotta give it up for the crew behind "Old Man Logan": they definitely went for broke and into places that even as often a dark a character as Wolverine, has never gone before. "Old Man Logan" is highly recommended, even if, like me, you are only a casual reader of comic books.